So, I am slowly restoring an old set of Khorns. I just took some measurements of the latest configuration and I'm wondering if this is looking like it's supposed to. Crossover: I built the ALK Universal crossover with Solen caps and Litz inductors on a k-500-5000 crossover board (1954). I'm using the old autotransformer on the board and the squawker is connected to the -3 and 0 tabs on it. Here are the measurements. 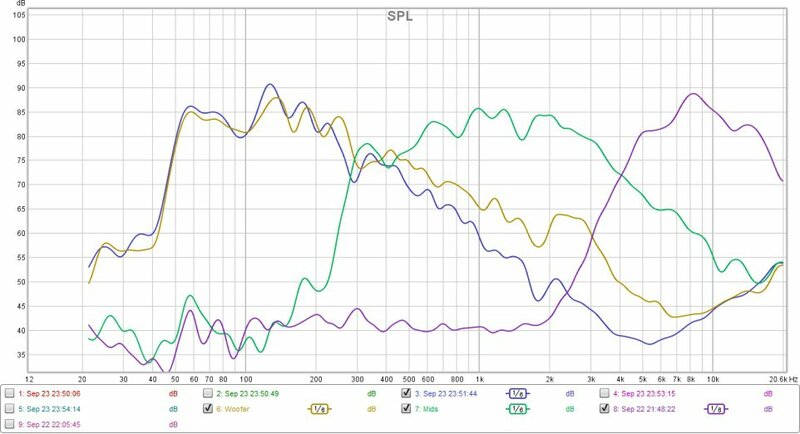 Is the woofer response supposed to look like that? It looks like it's not being properly attenuated on the upper end. I was hoping you had the stock 1.3mh inductor, as that would be way too low, and would account for your measurements. But the 5mh should have been better. 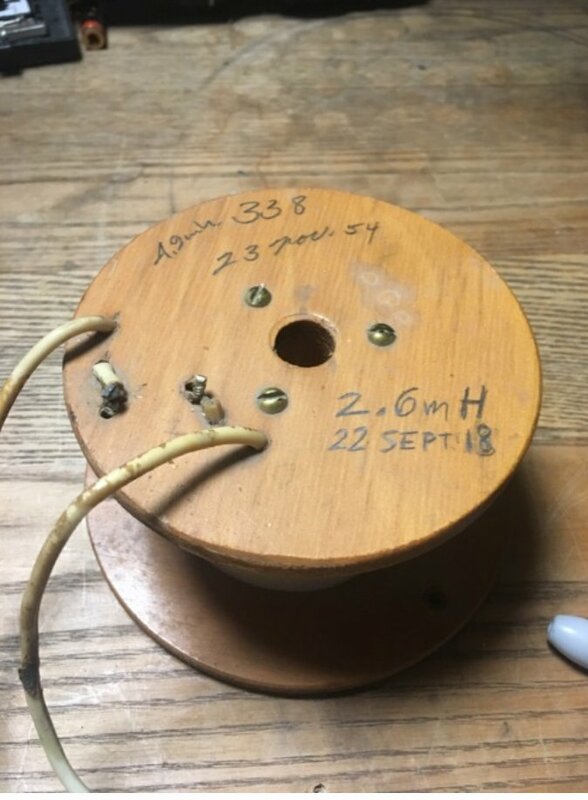 Any way to measure the 5mh to verify it's value? Try running your low-pass calcs using 20 ohms instead of 16. The bass horn raises the woofer's impedance a lot. 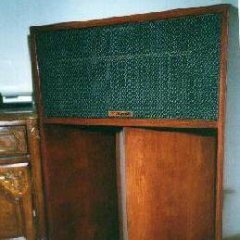 Al Klappenberger showed a Belle Klipsch' bass horn doubled the DCR of a K-33-E within its operating range. Ha - no it didn't. I tried adding a proper 5mH inductor in series with the 1.3mH and now the response looks much better. Updated woofer response in blue. Response is largely dictated by the limits of the horn. You should be able to use NO inductor, and see response dropping like a rock after 400Hz. Those are electrical simulations, not acoustic plots. 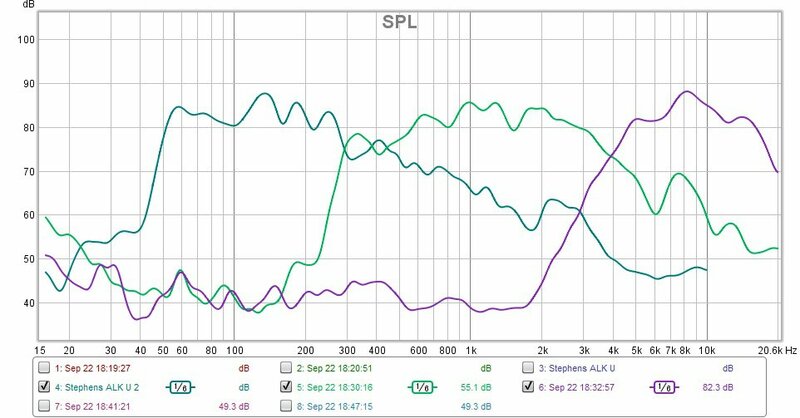 Here are anechoic curves of both the Klipschorn and Jubilee bass bins. I honestly don't know, but it you're measuring one section of the loudspeaker, you should be terminating the other sections with resistors. Use a 15 ohm resistor for the midrange, and an 8 ohm resistor for the tweeter. Thanks for those. Generally it seems to me they follow the AES article. Could you tell us a bit about your testing conditions and microphone placement. LMS has a gated function you might have used. I'm not sure that the AES article describes the conditions. I'd think that the anechoic chamber at Hope is only valid down to 200 Hz or so. JBL and NASA probably have larger ones. Of course the issue is to establish some "valid" or agreed to condition to test bass horns. There may be an outdoors trihedal corner at Hope. But then no room effects. If in a room, which room? Smile. Microphone placement is another issue. I've seen some suggestions of putting it close to the mouth (but where?). Maybe on the floor one, two, or three meters in front, or at some elevation. The Klipschorn bass bin is that close to the Jubilee? The 402 is good to about 500Hz isn't it? I'm not sure how Roy did the measurements, I had just assumed it was in the chamber. I remember being down in Hope while he was still tweaking the network, and much energy was expended moving the Jubilee in and out of the chamber.